The BHLI is a premier executive leadership development program established to cultivate the next generation of diverse underrepresented healthcare leaders. The BHLI provides leadership training with an opportunity to analyze current issues in healthcare with national leaders from the fields of healthcare, law, banking, and business with continued mentoring through placement in a paid internship in a premier healthcare environment. 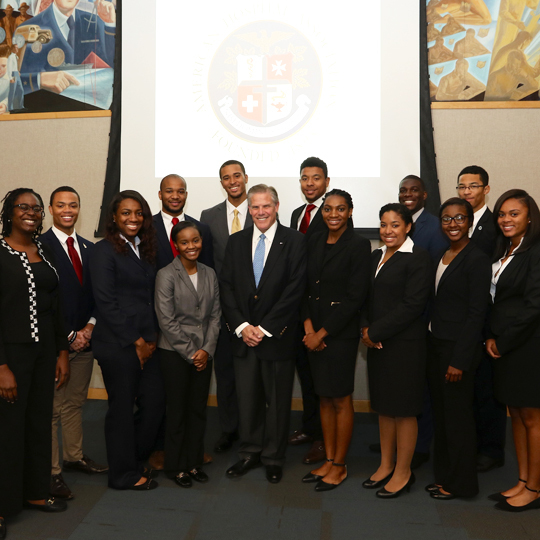 Underrepresented sophomore students possessing leadership skills and a minimum 3.2 GPA. Scholars from varying majors are invited to apply: accounting, bio-engineering, biology, business, chemistry, computer science, economics, engineering, finance, health administration, health sciences, marketing, nursing, pharmacy, pre-dentistry, pre-law, pre-medicine, psychology, etc. PHASE I TOPICS: Public health, public policy, health equity, health law, behavioral health, socio-economic determinants of health, etc. Presenters have included the following: Wright Lassiter, President and CEO of Henry Ford Health System; Patricia Maryland, President and Chief Executive, Ascension Healthcare; Ian Morrison, famed author, consultant, and futurist; Richard Pollack, President and CEO of American Hospital Association; Kathleen Sebelius, former U.S. Secretary of Health and Human Services; Dr. Bruce Siegel, President and CEO of America’s Essential Hospitals, and Esther George, President and Chief Executive of the Federal Reserve Bank of Kansas City, among others. BHLI Scholars have been placed at the following sites: Allscripts Healthcare Solutions, Inc., America’s Essential Hospitals, Atrium Health, Blue Cross Blue Shield; Catholic Health Initiatives, Centers for Disease Control and Prevention, Cerner Corporation, Children’s Mercy Hospital, Cone Health, Delta Dental of Minnesota, Duke University Hospital, John Hopkins All Children’s Hospital, Novant Health, Saint Luke’s Hospital, Swope Health Services, Truman Medical Centers, University of Kansas Health System, and Walgreens, among others. APPLY: Please complete the online application at https://www.blufordinstitute.org/apply by Monday, October 22 at 6:00 am. Upon review of the submitted applications, selected scholars will be invited to interview on the campus of University of Missouri-Kansas City (UMKC). Want to know more? Talk with other UMKC students who have participated in the Institute.